Dr. John Henrik Clarke, the late outstanding African-American historian, has brought the range of his years of scholarly work together in this single and comprehensive volume. The topics he covers are as varied and interesting as his experience in the Pan-Africanist struggle. Notes for an African World Revolution: Africans at the Crossroads is a collection of essays that have been broadly amassed in five thematic sections. Clarke begins with the roots of the African and African-American freedom struggle in the African World. A major section is devoted to a detailed discussion of the uncompleted revolution of five monumental African leaders: Kwame Nkrumah, Patrice Lumumba, Marcus Gravey, Malcom X, and Tom Mboya. The rest of the essays focus on topics ranging from the conquest of African to the struggles for freedom in South Africa and the Pan-Africanist movement. 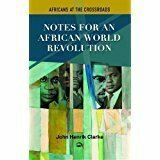 Clarke ends his collection with his important and timely essay Can African People Save Themselves?